X-DIGITAL TECHNOLOGY X-Digital wideband technology gives these controllers the ability to read and report values that other controllers do not, which can deliver more optimized engine tuning and a safer overall operating condition. The controller’s high speed digital implementation ensures no loss of signal fidelity and full transient response, making it able to identify the slightest fluctuations in AFR and output them in full value. WHY RESPONSE TIME MATTERS Faster response time improves wideband feedback control, and can provide a safer, more powerful and accurate tune. AEM’s Wideband Controllers with X-Digital technology can reduce deadtime and improve the performance of your vehicle through more accurate AFR tuning. Deadtime is the delay between when exhaust gas composition changes and when that change is reported by the O2 sensor. While flow of exhaust gases (transport delay) can affect deadtime, it is not the only source. Often, the sensing elements response to the gas is the largest contributor to deadtime when an engine is in high RPM under load. FACTORY CALIBRATION RESISTOR OR FREE-AIR CAL, IT’S YOUR CHOICE! The X-Series Wideband Gauge and X-Series Inline Controller support the popular Bosch LSU 4.9 sensor and can utilize both the factory calibration resistor and free-air calibration methods**. This allows users to take advantage of the precise factory resistor calibration when a sensor is new but then allows for free-air calibrations if the user desires when the sensor ages. It’s the perfect marriage of simplicity and accuracy! WHY USE A WIDEBAND AIR/FUEL CONTROLLER? Accurate AFR data is critical when tuning an engine. Running rich (very low air/fuel ratio, excessive fuel) can cause a loss in power, while running too lean (very high air/fuel ratio, not enough fuel) may result in serious engine damage. Using a wideband air/fuel controller during the tuning process allows you to monitor AFR and adjust tuning parameters to optimize them for maximum power and efficiency. 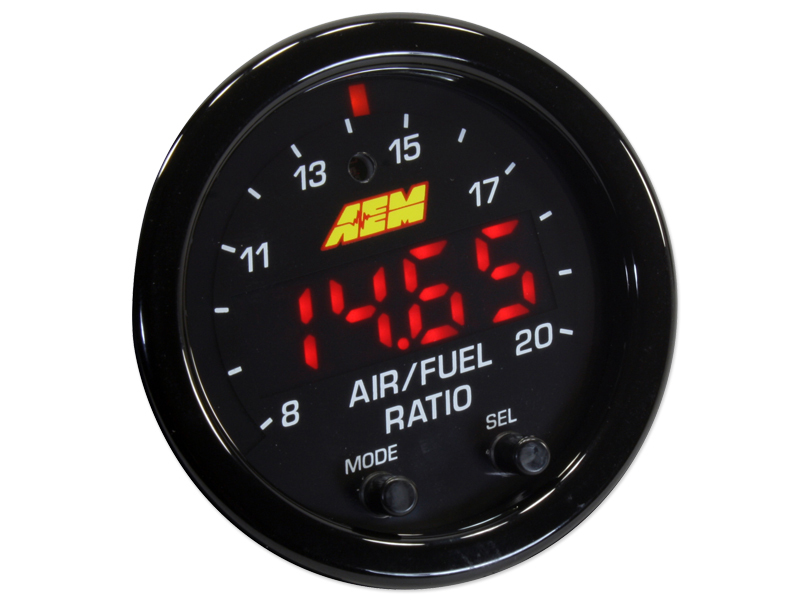 AEM has a comprehensive line of highly accurate, reliable wideband air/fuel controllers that can help ensure your vehicle is optimally tuned. CAN I CHANGE THE AEM UEGO SENSOR’S CONNECTOR? No. There is a laser-etched, calibrated resistor in the sensor’s connector body. This resistor is specifically created for the exact sensor that it is attached to. Modifying this will invalidate the sensor’s output.